Home-Cooked & Handmade: Any Questions? I've been participating the the Ultimate Blog Challenge this BLOGtober. Can you believe it's been 23 days? I know it's flown by for me! Up until now I haven't used any of the prompts sent in the daily emails to all the challenge participants. Mostly it's because I was trying to keep to the fall theme I set for myself. But this one seemed too good to pass up. Paul Taubman, one of the people who runs the challenge, suggested we ask our readers if they had any questions! Great idea. Thank you, Paul! And thank you for stopping by and reading my blog! It's been fun putting it together over the years and I appreciate readers, new and old. So, do you have any questions? Do you want to know more about me, my blog, crochet, cooking? 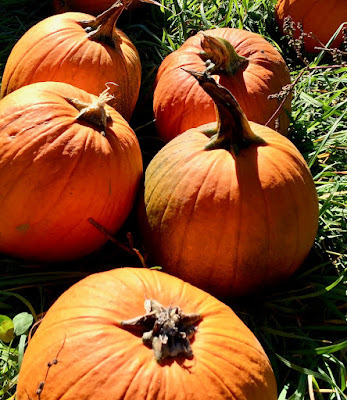 Do you have a fall themed question? 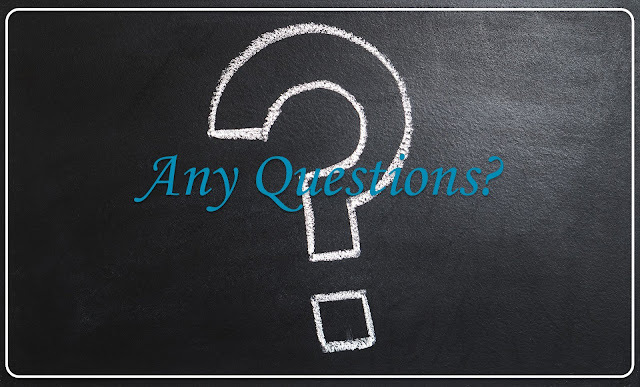 Do you want to ask something totally unrelated to the blog? It's up to you! Go ahead, ask anything! Write your questions in the comment section below and I'll pick a few to answer tomorrow! Oh, and here are some pumpkins to keep with the fall theme. I couldn't resist! What a great idea! Do you do handwork at meetings and social gatherings? Are people receptive to that? Why did you elect to participate in the October challenge? I've crocheted for almost 50 years so my question is: What was the most unusual item you ever crocheted? What made you start your blog? Have your results met your expectations? Would you do it again? I guess that's three related questions, plus I, too, like to also learn your reasons for participating in the challenge. I love getting to ask questions! What is your favorite thing to make? And how often do you make it? I so enjoy your blog! When did you start your blog and how has it grown since starting? Thank you everyone for your questions! I am writing up a response including many of the questions for tomorrow. What a great idea this was. Thanks, Paul! I have a question for you this morning. If you decided to take a cooking or crochet class who would you want to teach these to you. The person can be dead or alive.